I have a confession to make. I hate sailing and yachts. "So what?" you say. Well it was my Dad's hobby. 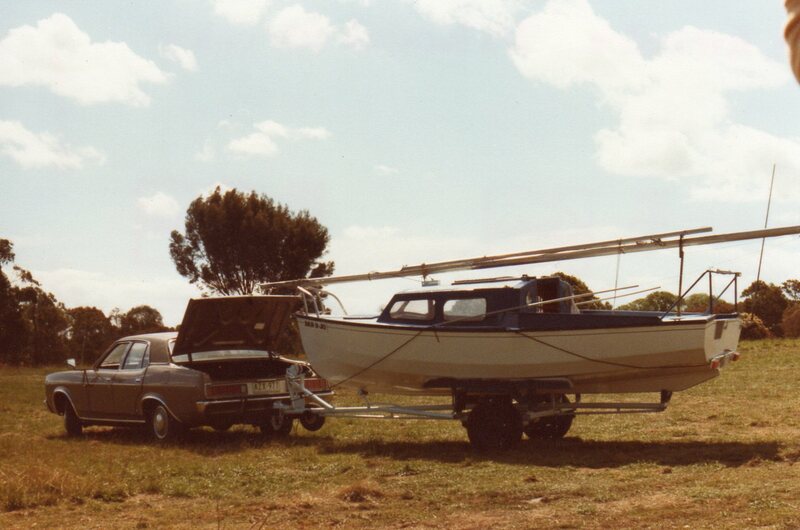 We owned sailing boats for most of my childhood, mostly "trailer-sailers". 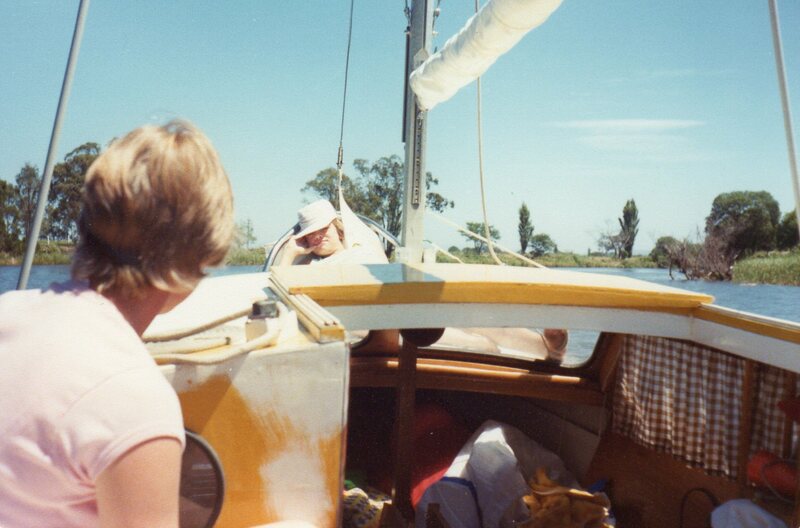 Dad even christened the boat after us girls. We had the Bar-B-Jo and the Bar-B-Jo II. 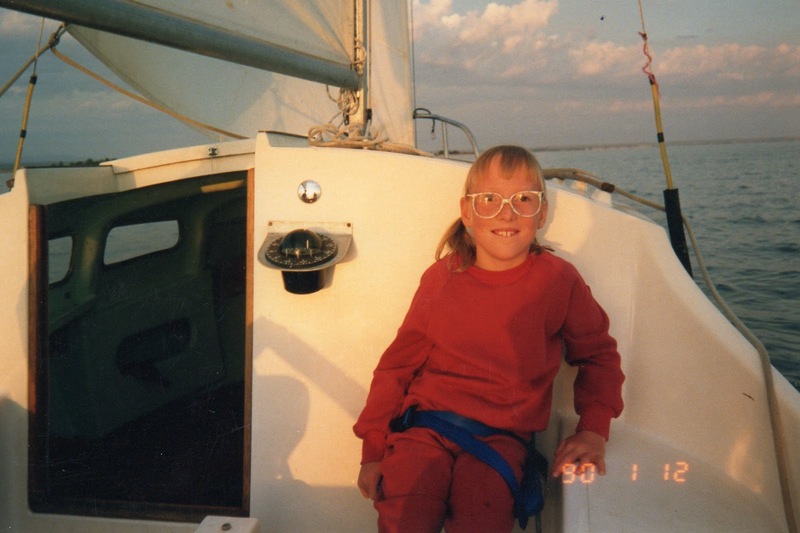 I vividly remember the incident that triggered my "I don't like sail boats" phobia. They lean and this means they can tip! 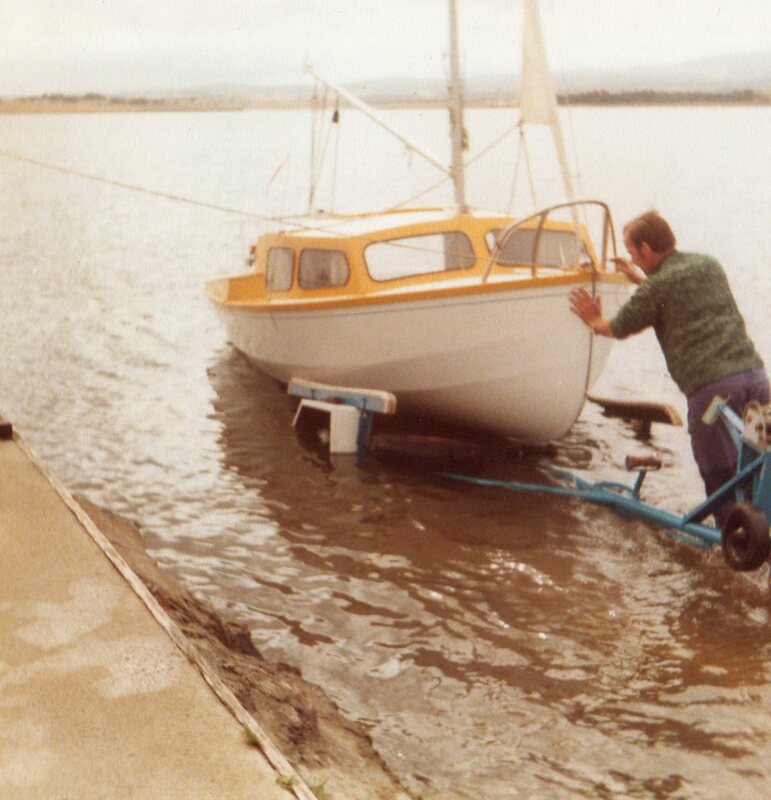 Dad's first boat was a Heron. When he first got it, he took me and my sister and my mum sailing with him on the Yallourn Storage Dam. We were all correctly bundled up in our life jackets. We got to the middle of the lake and we tipped over and he couldn't get the boat right side up again with all the sails up. We had to tread water in the middle of the lake till one of the ski boats from the local ski racing club came and rescued us. I can remember it was cold and I had a wool jumper on. The wool went all wet and squidgy and I was so heavy. 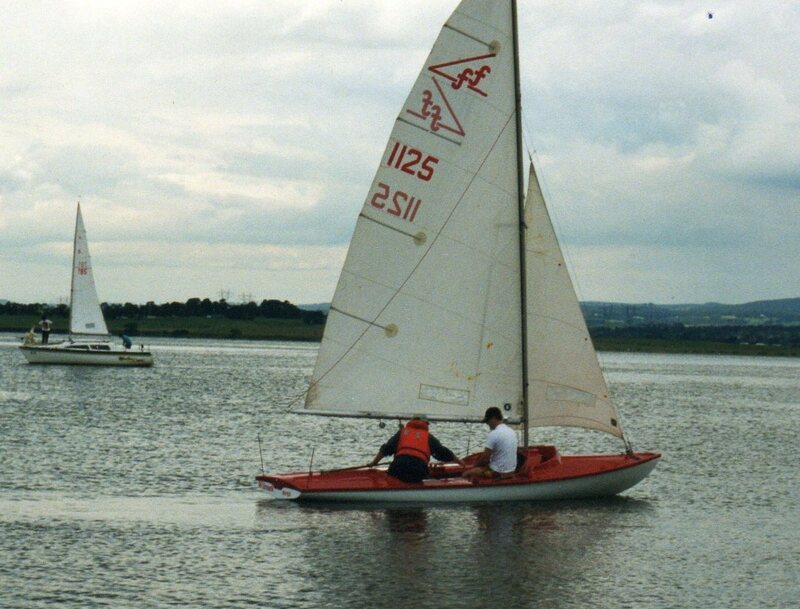 Great first introduction to sailing! You can understand why I never warmed up to sailing with a start like that. Needless to say my Dad got much better at it. 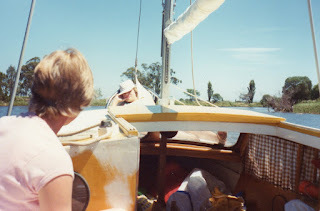 Yet as I was sitting and watching the start of Sydney to Hobart Yacht race on Boxing Day following in Dad's family tradition, I realized that I do sort of miss it. Yachts are an inextricable part of my childhood. 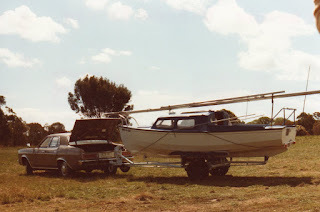 This is the first year we won't be going down to the caravan on the Gippsland Lakes in 30+ years. With my Dad gone and all of us getting older and at the stage where our kids have summer jobs, we weren't using it anymore. So Mum sold it a few months ago. Ends of eras are always sad. This is the first Bar-B-Jo. It was a Hartley TS16. When I looked at the back of the photo as I was scanning it, this is April 1978. 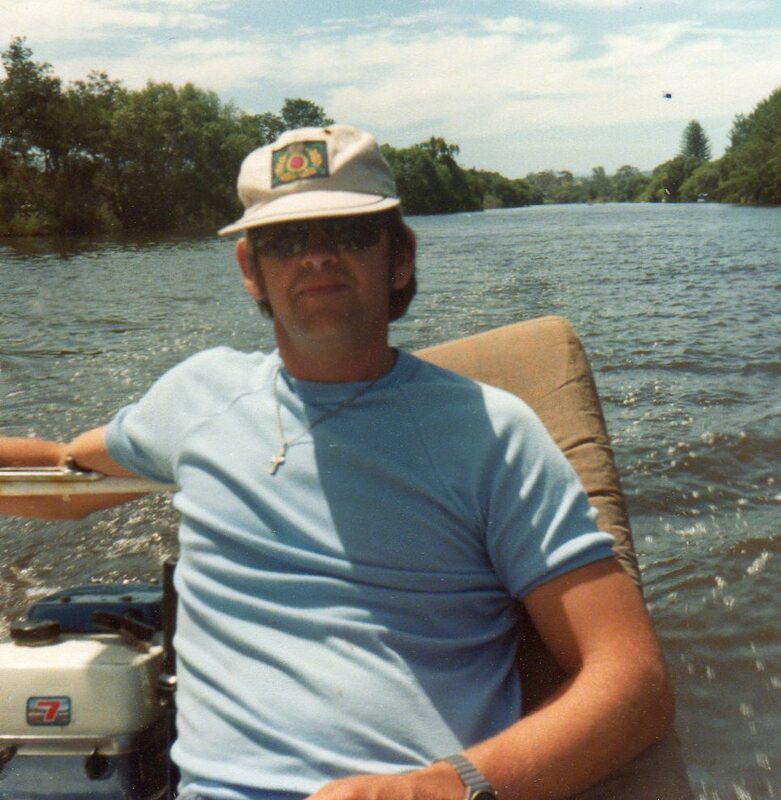 Here's me steering the boat down the Mitchell River one sunny day that same year. I was happy enough to go on the boat when we weren't sailing and just motoring along. You can see there are no sails up on this photo. In fact, Barbie is asleep on the jib. This is such a Dad shot. Dad the skipper, calm, confident and relaxed. 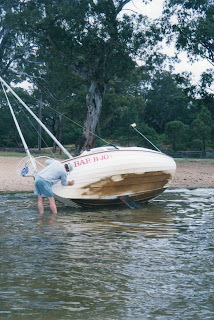 The Bar-B-Jo was a plywood wooden built boat and looking a little shabby and the hull was starting to leak so in the winter of 1981, it got a total makeover. I remember my Dad and my uncle stripping it to the bare bones and rebuilding it in our driveway. 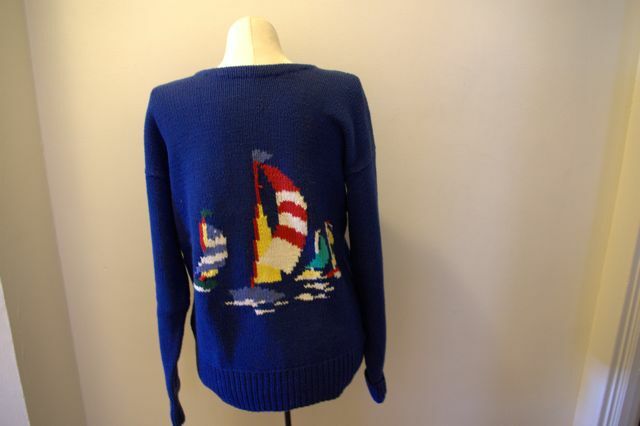 It got a paint job too and the Blue Hartley is the yacht of my teenage years. Eventually the Hartley rotted to bits and Bar-B-Jo II came along. 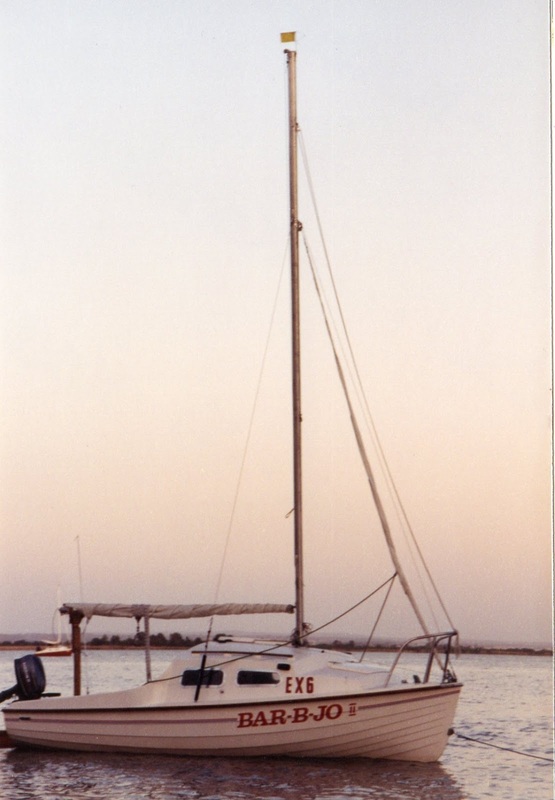 This was a Boterill Explorer 16, and was a fiberglass clinker built boat. My Dad felt he had sold out slightly because it wasn't wooden. This is the boat of my littlest sister's childhood. My youngest sister has Cerebral Palsy and very iffy balance. Dad used to strap her in on the slippery fiberglass so she wouldn't slide overboard when the boat leaned. Boats were a lot of work. Here's Dad cleaning the hull on the Bar-B-Jo II. We used to keep the boat moored to a buoy the entire summer and wade out to it. 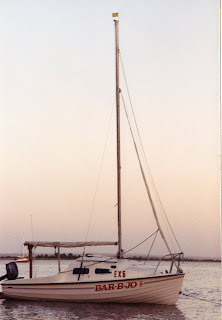 This boat is also the boat my husband and children remember. I remember epic runs catching skippys (Spickjacks) trolling off the boat with my husband in our early married years. My son was the last person to sail on Bar-B-Jo II with my dad, when my Dad was sick. I think the boy was about 4. After Dad died, we inherited the boat. We sold it and it became the money for a new kitchen. I think fondly of it and Dad quite frequently when I cook now. In the last couple of years of his life. Dad was looking for a new sailing challenge. So he bought and restored a Flying 15. 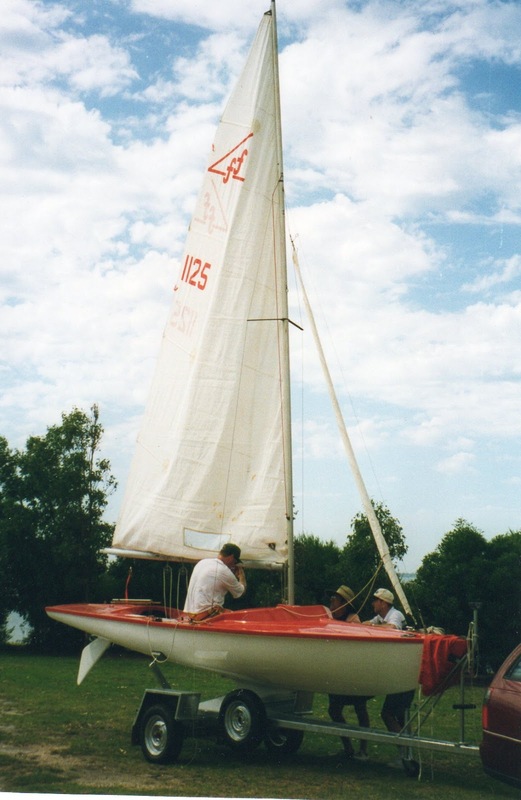 This is a racing yacht with trapezes out the side. It only really got a chance to be sailed once after its restoration before Dad got too sick. He painted it red, 'cos red goes faster. He named this one the Will-Mark after his first two grandsons. In hindsight, I think this was his mid life crisis red sports car. My sister and her family inherited this one. She was always a much better sailor than me. I had great fun raiding Mum's photo albums on Christmas Day to find the photos for this. It was a nice end to another epic Christmas dinner immersed in childhood memories. You may wonder, why I don't also have a phobia of woolen jumpers after the 'treading water in the lake in wet wool' incident. I worked hard to overcome this but the sound and feel of wet wool makes my teeth itch still. I can still appreciate a good wool jumper but avoid getting wet wearing them.